Blogger Phil Plait (Bad Astronomy) and his wife Marcella Setter founded Science Getaways, unique vacations that bring together science enthusiasts and scientific experts. 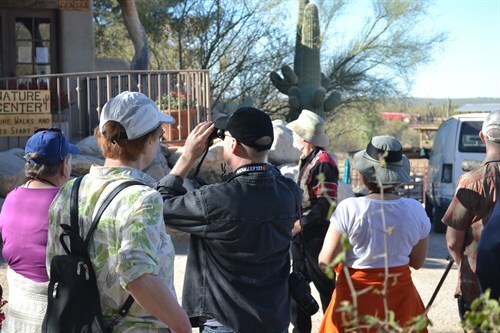 Team Celestron tagged along on their latest trip, Space Ranch, in Tucson, Arizona. 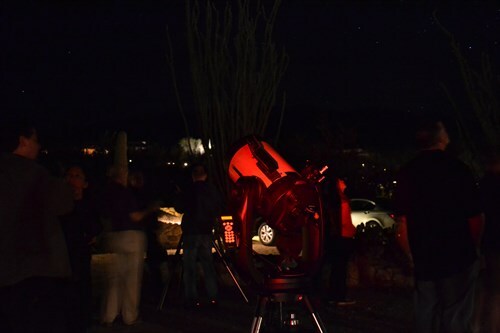 What better place to enjoy dark skies and Celestron optics than Tucson? Arizona is renowned worldwide for some of the darkest and most beautiful observing sites, so it was the perfect location for Space Ranch 2014. This “freestyle vacation” combined outdoor activities like horseback rides and cowboy cookouts with science-based activities like a tour of Mount Lemmon SkyCenter and, of course, stargazing. Our backdrop was Tanque Verde Ranch, one of Tucson’s most luxurious guest ranches complete with stables, a fishing pond, and a grand communal dining room. Space Ranchers stayed together in the Quail Hollow cluster of rooms and enjoyed the common courtyard area for socializing and observing with Phil’s 8-inch Celestron telescope. Phil invited a few of his VIP friends to join us for the weekend. I was amazed to find myself sitting down to dinner with astronaut Charlie Walker, who spent nearly three weeks in orbit during three Space Shuttle missions. As we enjoyed our meals, Charlie let us in on the secrets of space flight, like how astronauts keep in shape in zero gravity. One of the other guests was a 17-year-old aspiring astronaut, and Charlie gave him lots of insider tips for college and beyond to help him achieve his dream of orbiting aboard the ISS. After dinner, we headed back to Quail Hollow for our first star party. 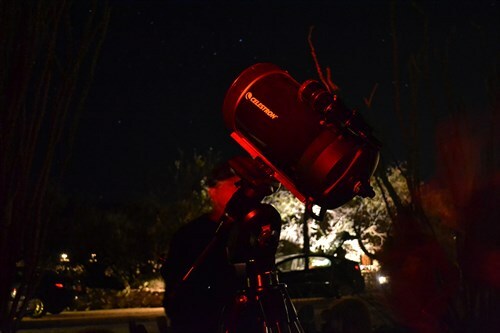 We had two Celestron telescopes to choose from: Phil brought out his 8-inch Schmidt-Cassegrain and Advanced GT mount, while another guest set up his new CPC Deluxe 1100 HD, which he drove to Tucson from Northern California. Under relatively clear skies, the scopes did not disappoint. Many guests enjoyed their first views of galaxies, and Phil helped guests identify constellations. Then, Phil pointed his telescope at the galaxy M82 and spotted something truly special: a supernova. Although he’d written his Ph.D. dissertation on the subject, he’d only observed one visually before this night. As we stepped up to the eyepiece, he explained that we could see the supernova as a bright flash using averted vision. Everyone got a glimpse! The sight was even more impressive through the 11-inch EdgeHD telescope. 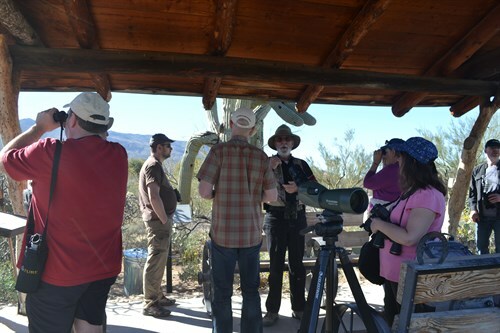 After an exciting evening of stargazing, we awoke bright and early for a birding walk with an experienced guide from the Tanque Verde Nature Center. 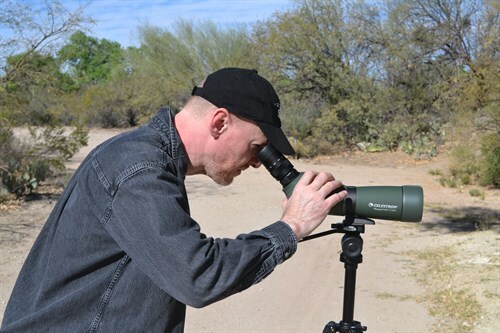 It was Phil’s first birding trip, but he was prepared with our TrailSeeker 8x42 binoculars. Right outside the Nature Center, we viewed several types of hummingbirds and gold finches. As we hit the trail, we saw quail, cardinals, and a phainopepla, which looked like a black cardinal with red eyes. Near the fishing pond, we locked the Celestron Regal M2 65ED spotting scope on a blue heron perched at the water’s edge. He seemed to stare into the spotting scope for more than 10 minutes! Space Ranchers met for a cowboy-style barbecue lunch (and quick solar observing session!) before packing our warmest clothes for the journey to Mount Lemmon SkyCenter, elevation 9,157 feet. Charlie Walker’s wife Susan had warned me about the beautiful views I could look forward to on the bus ride. As we ascended the mountain, she said, we would pass through a range of different natural biomes and habitats. Sure enough, I saw huge saguaros give way to denser foliage, followed by evergreen trees, and eventually snow. But there was one unwelcome sight on the drive: dense clouds and a light, misty rain. At the top of the mountain, we seemed to be at the base of a huge, thick cloud. Stargazing, unfortunately, was off the agenda for the evening. Instead, we toured the SkyCenter grounds and had so much fun looking at amazing telescopes we (almost) didn’t notice that we didn’t actually get to observe. The 32-inch Schulman telescope is the largest telescope in the United States dedicated to public outreach. Had we been under clear skies, we would have spent the evening viewing objects in its massive 32-inch mirror. The Catalina Sky Survey operates an even larger telescope atop Mount Lemmon: the 60-inch Steward Observatory Telescope. Standing beneath this behemoth, we learned about the Sky Survey’s important work searching for near-Earth objects—and potentially protecting us from the next catastrophic meteor impact. 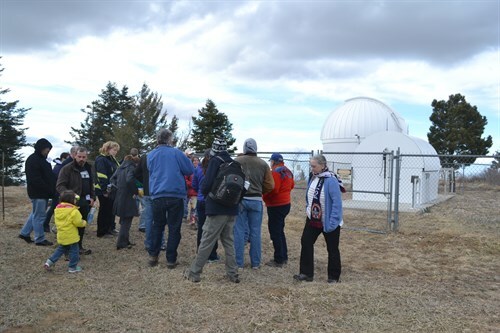 We also viewed the geodesic dome originally used for the military’s large radar, and an observatory that is operated remotely by Korean astronomers. 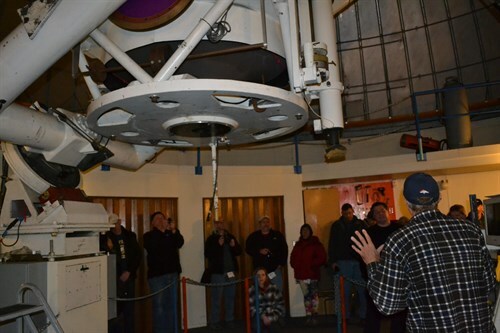 After our tour, guide and astroimager Adam Block performed a variety of scientific experiments and demonstrations. We viewed cosmic rays in a chamber of liquid nitrogen, pointed a thermal camera, and listened to a lecture about the massive scale of the universe. In almost total darkness, we descended the mountain and headed for warmer temperatures. The weekend continued with more speakers, outdoor activities, and stargazing. As Space Ranch drew to a close, many guests were eagerly planning their next Science Getaway. Should you wish to join them, Science Ranch 2014 will be held this June at Waunita Hot Springs Ranch in Gunnison, Colorado. Stop by and don’t forget to take a peek through Phil’s Celestron 8!